In the shadow of Mount Denali, 27 miles from the nearest paved road, chef Dave Thorne melts water from glacier snow and tosses reindeer sausage into everything from paella to breakfast scones. Dedicated chefs will do anything for their craft—fishing, hunting, foraging or growing their own produce. But few chefs start their days in the kitchen by melting their own water. From glacier snow, at that. 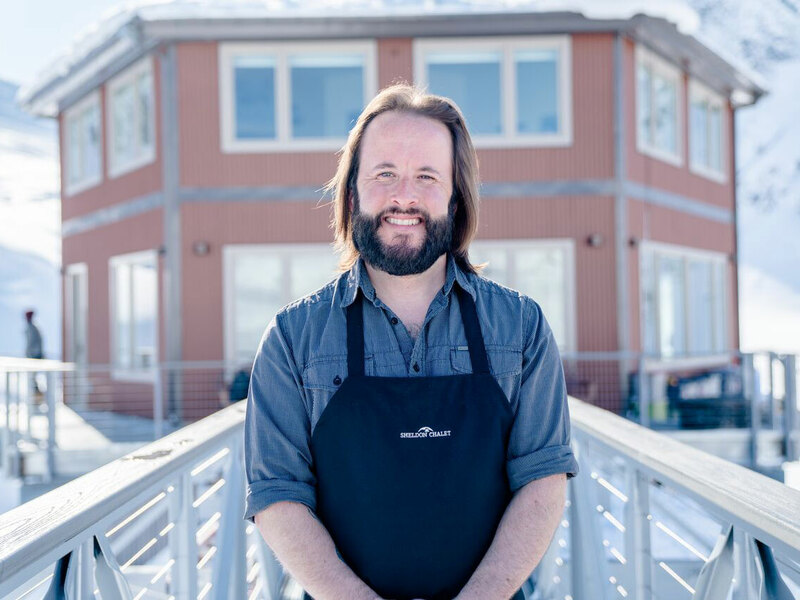 Dave Thorne—known to many in Alaska as “Delicious Dave,” as he named his former catering company—is the resident chef at Sheldon Chalet, a new five-room hotel in the heart of Denali National Park. 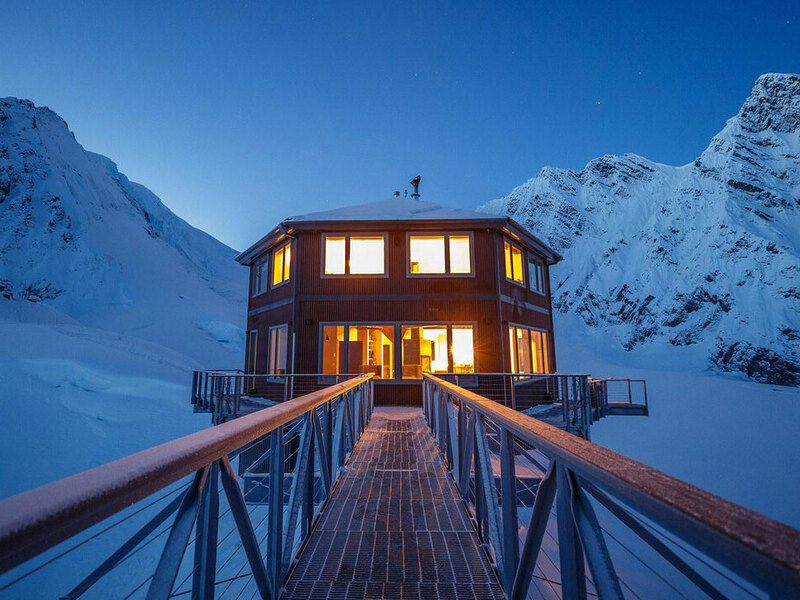 Perched on a nunatak (rock outcropping) on the mighty Ruth Glacier, the chalet is 52 miles from the nearest town, 27 from the nearest paved road. Access is by air, and air alone. It’s impossible to overstate the remoteness. 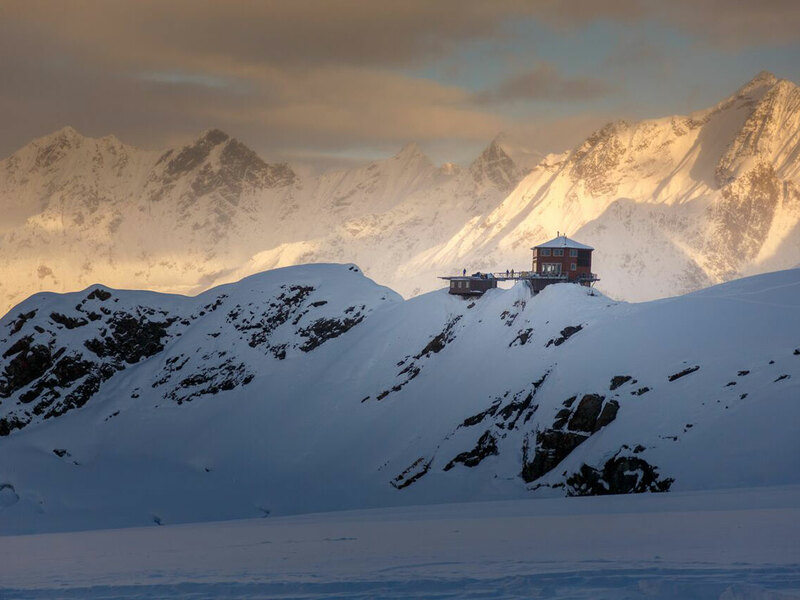 Guests arrive by helicopter and emerge over a mountain ridge to see a vast snowy amphitheater ringed by some of the tallest mountains in the Northern Hemisphere. In this endless landscape, a small rock outcropping is dwarfed by its surroundings—it’s crowned by a building that seems smaller still. But as the helicopter nears the chalet, its clean, geometric form comes into view. 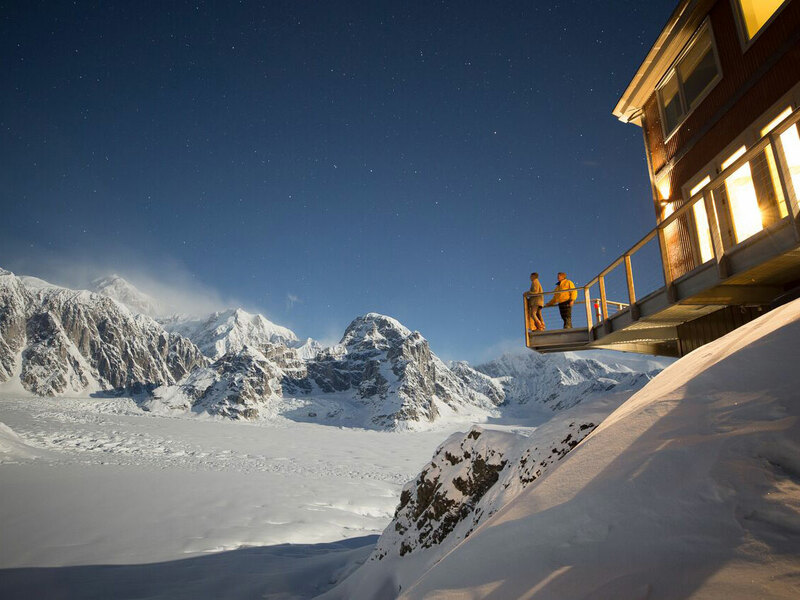 Until Sheldon Chalet’s opening earlier this year, only the most dedicated mountaineers came to this stretch of Denali National Park. (If you wanted Champagne on the glacier, you’d have to budget the weight of a full bottle on the way in, and an empty bottle on the way out. The idea of eating anything more elevated than trail mix or canned chili was only a pipe dream.) So it goes without saying that the logistical challenges Thorne faces just to get his job done aren't the kind most chefs face. “I turned into a mountaineering chef by default," Thorne says. Running water is perhaps the most basic requirement for a kitchen or a hotel, but at the chalet, it’s something of a technical marvel. Thorne, the chalet’s mountain guides, and property concierge Sissy Adams are tasked with melting water from glacier snow before each round of guests arrive, scooping up 40- to 70-pound totes of snow and hauling them up the nunatak, to a large tank that slowly drips water over the surface of the snow, helping it to melt evenly. In all his work, Thorne’s Alaska roots aid him considerably. He previously ran a produce delivery service called Alaska Root Sellers—a tattoo of its logo, a large and leafy beet, stretches up his arm—which helped him establish deep relationships with farmers and others in the region. It’s through his trust in them that he can order sight-unseen. 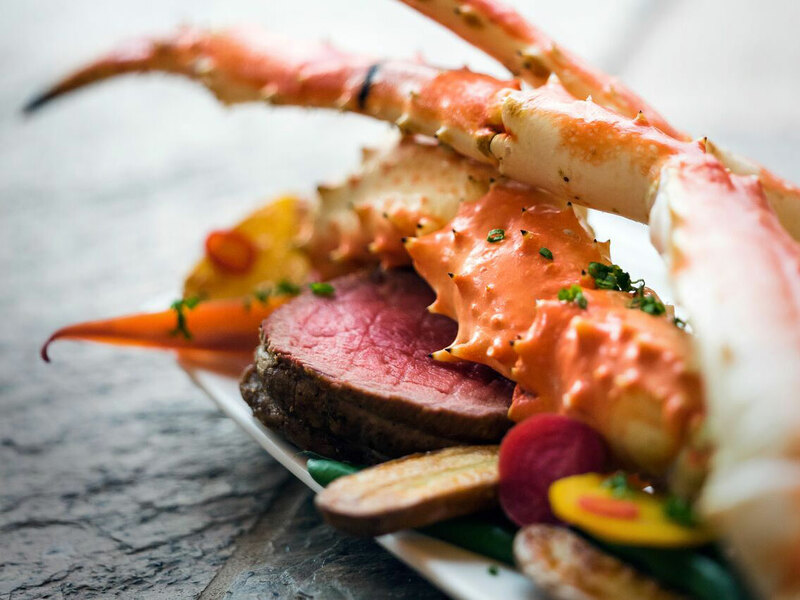 The seafood spread on arrival—sweet Alaskan oysters, halibut ceviche, tiny spot shrimp, king crab, with Alaskan rhubarb cocktail sauce and local spruce tip mignonette—is the first indication into the level of cuisine. Eating at Sheldon Chalet is to be constantly met with surprises, from the homey and comforting—afternoon cookies, hot from the oven—to the borderline ridiculous—thermoses of sangria midway through a glacier trek. Alaskan touches are everywhere, too. A charcuterie spread served after a glacier hike, along with cheeses from the Basque region and from Burgundy, includes a bresaola made from bison, which Thorne suggests guests pair with a blackberry saison from Anchorage Brewing Company. It’s all accompanied by fresh pickles from his Alaska forager—pickled fiddlehead ferns, delicate spruce tips, the allegedly-medicinal Devil’s Club plant. He’s a fan of moose—“Like a huge deer, with a beautiful clean flavor; I do a Bordelaise-style braise using Alaskan blueberries and thyme, to mimic what the moose are eating”—and reindeer sausage, which might show up in a savory breakfast scone one day, in a paella the next. Trained at the Culinary Institute of America, Thorne worked at restaurants in Alaska, Germany, and California before spending five years on the road as Neil Young’s personal chef. He was chosen to cook for Obama on the then-president’s 2015 Alaska tour, (“The dude was so cool, I was so honored; he loved the razor clams, the moose, everything we served him.”) and for Justin Timberlake on the FutureSex/LoveSounds tour (“We did a barbecue at his parents’ house one night; you should see the guy’s trophy collection.”). Thorne’s kitchen is compact but well-equipped: two convection ovens, a six-burner stove, all the gadgets (the Cuisinart, the Vitamix, the Robot Coupe). But with a restless, almost giddy culinary imagination, he seems happy to work with far less. On days off, Thorne treks out into the crevasse field with the mountain guide Nikolai Windhal and the two dream up meals to serve out on the glacier—and then strategize the logistics. The latest project, which they’ll enact in the next few weeks, is a full bouillabaisse dinner cooked out on the glacier, on a table dug into the snow. They’ll lay down insulated blankets for dry seating, put out a full wine service. (Chilling the whites should be no problem.) Thorne will be right in the middle, cooking the seafood stew over a portable butane stove. It sounded like the only meal that could possibly top my favorite at the chalet. Snowshoeing out on the glacier, I’m acutely aware of the many miles between me and civilization. It felt like a mirage to come around the corner and see a “table” that the mountain guides had dug into the snow—and that’s before they whipped out the portable stove and cast iron pans. In 15 minutes, there’s a hot lunch of king crab cakes with poblano-tomatillo aioli, with an Alaskan barley salad in a ginger-roasted sesame vinaigrette. On a clear summer day, Thorne can see Mount Denali has he preps for dinner service. During the winter, the Northern Lights swirl across the skies just outside his kitchen window.